Sofia Härdig is nominated to Composer of the Year by Manifest 2017. "With sweet tools, Sofia Härdig can strike the world with amazement. A guitarist from bob hound, a concert pianist from Australia and a synthesizer who had made a success on the Antique Round. A musical visionary can use them all. Sofia Härdig steps up and manages the task greatly on the new album, Changing The Order… Sofia Härdig is often compared to PJ Harvey, Patti Smith and Tom Verlaine. 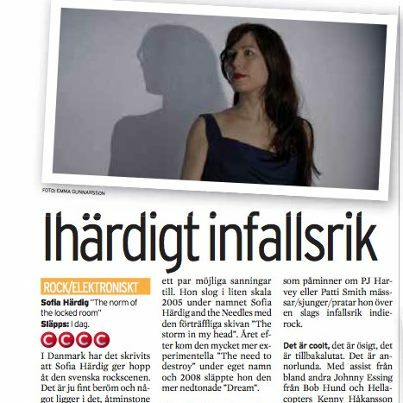 Heavy references but Härdig does a good job of cutting out her own niche"
"Here she builds a shadowy electronic groove, spices it with a chilly piano and sings straight out to the night with her bluesy Patti Smith-voice about a loneliness that can light up the night sky. It's well-composed, with a handsome production signed Jari Haapalainen, and should work excellent at clubs this spring"
© June 2011–April 2019 Sofia Härdig & Martin Thörnquist.